Honor 5C Smartphone is the official 2016 device released by Huawei, which is a major upgrade after Honor 4C and Honor 3C announced few years back. 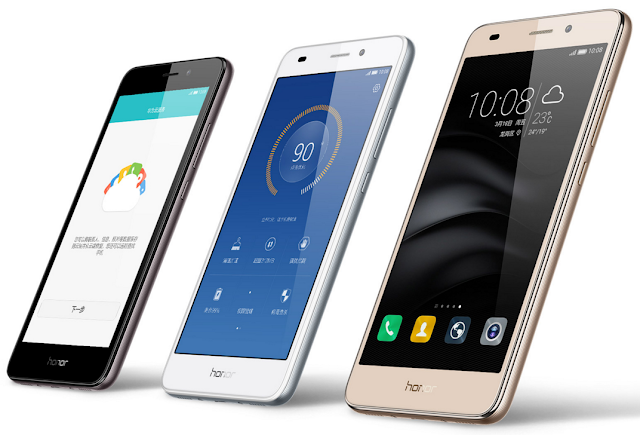 Huawei Honor 5C is powered by newest Android 6.0 Marshmallow (EMUI 4.1) mobile operating system and it's SoC is based on Huawei's home-made chipset i.e. HiSilicon Kirin 650. In this post, we are writing a detailed Huawei Honor 5C Review, Specifications, Features and Price details for our readers, followers and smartphone lovers. Based on hardware and software details, Huawei's latest flagship is the metallic body mid-range phone and it's available in GSM (2G) / HSPA (3G) / LTE (4G) variants, and it's a dual-SIM phone support Nano-SIM. The display is IPS LCD 16M colors with 5.2 inches screen size (68.7% screen-to-body ratio) and resolution is 1080 x 1920 pixels (424 ppi) with multitouch support. Honor 5C SoC is powered by HiSilicon Kirin 650 with CPU supported by Quad-core 2.0 GHz Cortex-A53 + quad-core 1.7 GHz Cortex-A53 with GPU Mali-T880MP2. The smartphone also has storage card slot of microSD, upto 128 GB with the addition of 16 GB internal memory, while RAM includes of 2 GB. The primary camera of the device is 13 mega-pixel (f/2.0) with autofocus and LED flash support with video recording capability of 1080p@30fps, whereas the secondary camera is of 8 mega-pixel (f/2.0), which also features HDR, panorama, smile/face detection, touch focus and geo-tagging. For connectivity and communication, Honor 5C includes; Wi-Fi 802.11 b/g/n (hotspot), Bluetooth 4.1 (A2DP / LE), GPS with A-GPS, BDS, GLONASS, microUSB 2.0 and FM Radio. It also support various sensors i.e. compass, accelerometer, proximity and fingerprint. The Huawei Honor 5C has non-removable 3000 mAh battery. 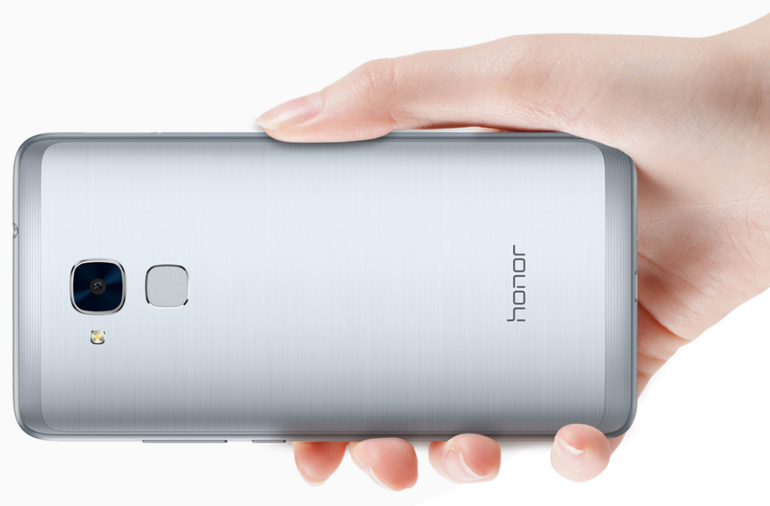 Currently, Honor 5C is only available in China from this month April, 2016, and it’s expected to be release worldwide after few months. 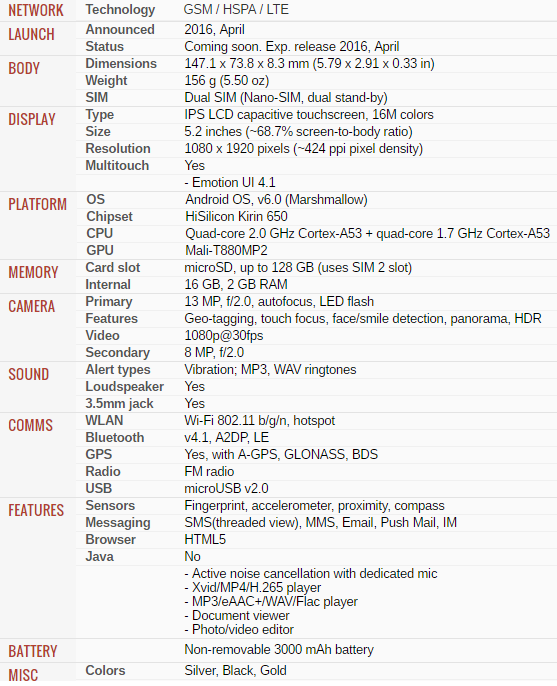 Huawei announced the official approx. price of Honor 5C Smartphone starts from; $140 USD for 3G, $155 USD for 4G LTE and 899 CNY for 3G-only model, while 999 CNY for 4G-enabled versions.